We'd quit work for a three week break in Zimbabwe before we started new jobs. We took a night flight from London direct to Harare, where Rory's mum, Shirley, met us at the airport and took us home to the farm, a little way north of Harare. On our first day we took a walk in the "back garden". this is a couple of hundred acres, mostly given over to a wildlife reserve. 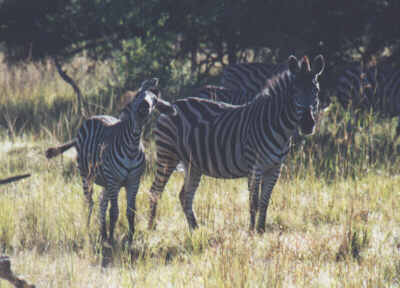 To my astonishment, up popped a herd of zebra, some wildebeast, and a family of giraffe. It kinda beats dog poo and sparrows in the local park. Easter Eggs and presents distributed, it was suggested that as a first timer to the country, it might be nice for me to do the traditional tourist trip up to Victoria Falls and Lake Kariba. We decided to pack light - the weather was warm, and took one small bag with us. For some reason we decided to check it in at the airport. This bag was to make a round trip of another 400 miles when they sent it to Kariba accidentally. I was deperate to see Vic Falls, so we dropped what was left of our luggage at the Sprayview Hotel and walked straight down to it. You can hear the roar from at least half a mile away. We went in through the main gate, had the obligitory photos taken under Dr Livingston's statue, and walked down to the first viewing point. The first thing that stikes you is how big Vic Falls is. The next thing that strikes you is how WET you're going to get. 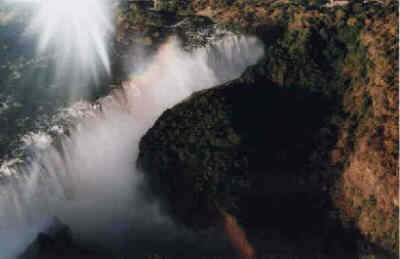 The spray, pouring over the edge of the Zambezi at upto one million cubic litres a minute during the height of the wet season, leaves a permanent mist hovering above the river (as can be seen from the picture below) and a permanent shower over most of the nature reserve. We walked along the pathway, pausing every so often to take in the scenery. The problem at ground level was the spray. We could barely see across 100m to the other side of the falls. This photo gives a fairly good impression of the amount of spray. One thing you may be wondering at this point is how I got the aerial shots. On the second day, and having not really been able to see much across from one side of the falls to the other, we thought it might be a nice idea to take a flight over the falls in a Cessna. If you ever go to Vic Falls, if you only do one thing, go on one of those flights. 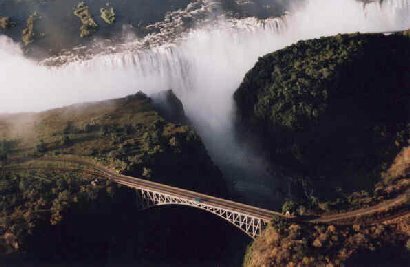 We had about 40 minutes of flying every angle over the falls, almost gliding 20 feet above the river before heading off over the plains to look for elephants, buffalo and giraffes. The picture on the right has been enlarged somewhat, but we got as close as the boat was able to without the hippos getting p***ed off and coming after us. 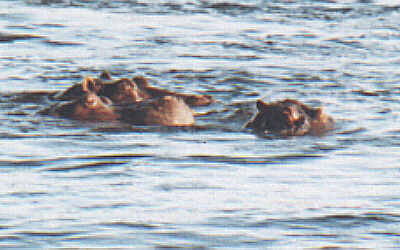 Hippos are the most common of human death on the Zambezi. Another lovely thing at Vic Falls was the cruises on the Zambezi. We took two cruises, one sun-downer cruise (see the picture opposite), and one at lunchtime. That was a bit weird - we turned up to find that it was us and a crew of three for lunch! We got close enough to see some hippos. Before we left Vic Falls for Kariba, we took a bike ride up to "Big Tree", which is in fact, a big tree. It is suggested that it is 2000 years old. All I can say is that my bicycle ride turned into a one-woman Himylayan trek up hills that were at least 1 in 20 (and I had a slightly flat tyre.) See also "Mountain Hippo" in Chad. And so off to Kariba. Our destination, the Carribea Bay hotel, right on the edge of Kariba. We flew in to see elephants tampling over somebody's back lawn. The Sprayview Hotel in Vic Falls had been adequate - this was luxury. African shields and paintings on thw walls, thick wooden doors, a 4 poster bed. Full satellite TV, I was able to watch the Arsenal vs. Man U FA cup semi-final game live...(oh, how I shouldn't have bothered, although I concede Gigg's goal was something special) We also encountered a casino, with real chips and everything. We were betting Z$100 in one go at the roulette table. Granted, there were Z$60 to the pound at the time, but it felt good. Having totted up our wins and loses on the roulette, blackjack and poker machines over about 3 hours, we'd spent...ten quid. We took a trip over to Kariba Dam. 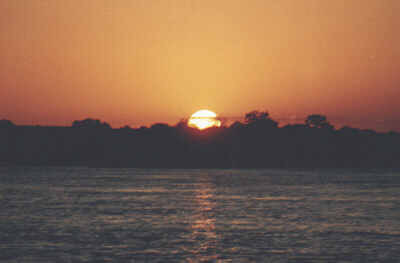 It's the largest in Southern Aftrica (the biggest on the entire continent is the Aswan in Egypt.) 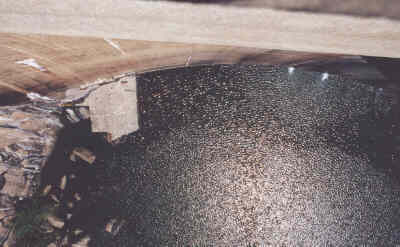 It's a long way down! 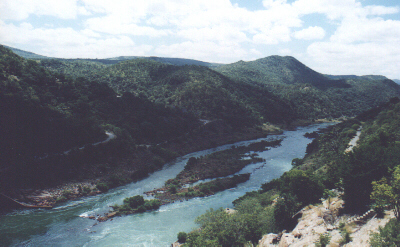 The picture below shows Zambia on the left bank and Zimbabwe on the right. And so to our return back to Harare. Somebody somewhere had ripped off part of our tickets that they shouldn't have, so we ended up trying to explain this to the particularly good example of a manderin who wouldn't let us on our flight, even though our names were on the flight list and we had the rest of our documentation. Rory resorted to his best "We are but mere usless tourists" pandering (which, despite the fact he's actually a local, worked in the end) whilst I smouldered in the corner mumbling about contacting the British Consulate and writing letters of complaint to Air Zimbabwe. 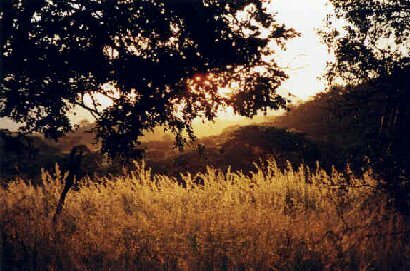 This in one of my favourite pictures - late afternoon at Domberwara.